As mentioned above, Endo Internationahl is having a strong trading session today after announcing patent news. According to the announcement, the news surrounds one of the companies operating companies known as Par Pharmaceutical. ENDP announced today that Par Pharmaceutical has been issued a new patent by the USPTO surrounding Vasostrict 20 units/ML. The patent number that has been issued is 9,375,478 and will expire on January 30, 2035. The company also announced that the new patent will be submitted to the United States Food and Drug Administration’s Approved Drug Products with Therapeutic Equivalence Evaluations. This is also commonly known as the Orange Book. The submission date to the FDA is June 28th, 2016. This is an added layer of protection. When a treatment is Orange Book Listed, it requires any Abbreviated New Drug Application applicant seeking FDA approval for a generic version of Vasostrict prior to expiration of the patent to notify Par Pharmaceutical of its ANDA filing before it can be FDA approved. This is a big step when it comes to ENDP being able to protect its intellectual property. As investors, one of the first things we learn when we start to work in the market is that the news causes big moves. Of course, positive news will lead to gains while negative news will lead to declines. 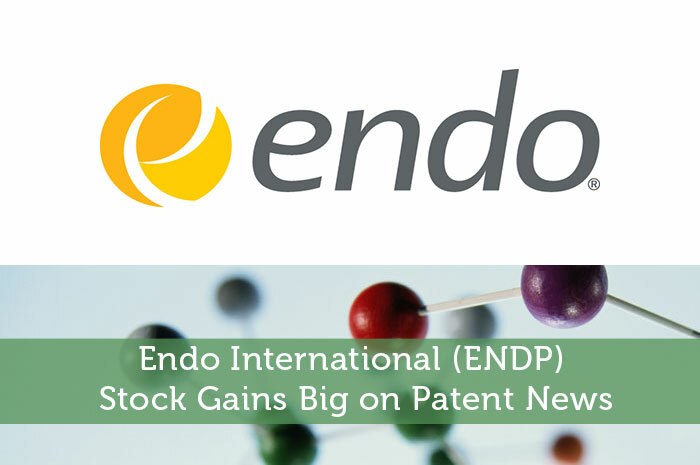 In the case of Endo International, the news that was released today was overwhelmingly positive. As a result, we’re seeing strong gains in the value of the stock today. Currently (3:46), ENDP is trading at $16.36 per share after a gain of $2.67 per share or 19.50% thus far today. Moving forward, I have an overwhelmingly bullish opinion of what we can expect to see from ENDP. Today’s news protects a very important piece of intellectual property. In fact, Vasostrict is the fist and only vasopressin injection, USP, product that has been approved by the FDA to increase blood pressure in adults with vasodilatory shock who remain hypotensive despite fluids and catecholamines. Because of the new patent, Par Pharmaceutical, an important subsidiary of Endo International won’t have to worry about generic competition for several years to come. As a result, I’m expecting to see a continuation of strong revenue from the treatment. All in all, when we talk about ENDP, we’re talking about a company that has done an incredible job with regard to getting its treatments approved. Now, they are proving their abilities when it comes to protecting approved treatments. With that said, I’m expecting to see strong gains moving forward. Where do you think ENDP is headed moving forward and why? Let us know your opinion in the comments below!